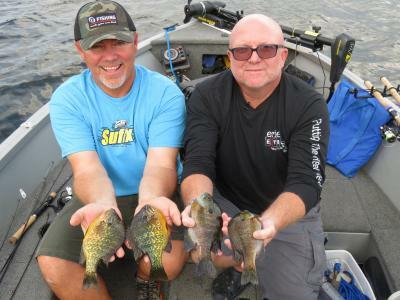 Professional angler Dave Lefebre (left) and cameraman Terry Olsen (right) have caught many specimens u2014 and the attention of audiences as far north as Toronto u2014 with their Erie Extreme program, a hybrid between a reality show and a fishing show that doesnu2019t necessarily pander to either audience. The shortest distance between two points is a straight line — but when that line is attached to a reel, the experience is often anything but straightforward. Reality is apt to take the jig and jerk that straight line in any direction. Few people are more aware of this truth than Erie native Dave Lefebre, a veteran pro angler who currently tours with both the Major League Fishing and BassMaster Elite Series. Weather changes. Conditions change. The fish you were after may boycott your party completely; at the same time unexpected guests may show up in droves. "Maybe one out of four times it actually works like you want it to." Lefebre, who had always wanted to host a show of his own, resolved to tackle this matter himself. "I wanted to show what was really happening, but didn't want a full-fledged reality show or a full-fledged fishing show. I've never really liked either of those. My goal was to get everyone but those guys to watch, to entertain everyone, even old ladies." Unfortunately for those old ladies (and the rest of us), the networks weren't as eager to stir things up. Conservative network execs don't want to sort through the swirling sediment of reality; most prefer the predictable clarity of a climate-controlled aquarium. The solution of, course, was to keep it local. Lefebre cold-called Lilly Broadcasting and spoke with Terry Olsen, a senior business and marketing consultant. Olsen, himself an avid fisherman, took the bait. It was an upstream battle, but Lefebre's vision had finally spawned. Erie Extreme, now in its second season, follows Lefebre and Olsen (who serves as cameraman) through the entirety of a day fishing, for better or for worse. "We capture every moment of the whole shoot. The camera is on all the time," explains Lefebre. Backup cameras, batteries, and memory cards are always on hand because "we don't want to miss anything that happens." Because the footage is always rolling, it's easy to forget the cameras are even there. "It's like if Seinfeld went fishing," says Olsen. "You start watching it and get sucked in." What's the hook? According to both Lefebre and Olsen, it's northwestern Pennsylvania. The show does well capturing both the culture (in segments such as "Hometown Faces") and astonishing ecological diversity of the region. Says Lefebre: "Within 50 miles of here … there are currents, creeks, rivers, man-made reservoirs/dams, marshes, natural lakes, and glacial lakes. Just a huge variety … diversity is something that as we go along people will notice. Truthfully, our backyard is as good as it gets. I've fished the so-called number one places in the country. I'll get the shakes beforehand, but then I get there and am like 'this is it?' It might be good, but nothing holds a candle to here." Lefebre is quick to praise the ecological diversity of his native Northwestern Pennsylvania. "Nothing holds a candle to it." Both that variety and the devious challenges viewers concoct for the intrepid fishermen have kept the creative rudders spinning. Olsen explains: "It's something like Mission Impossible — 'your mission, if you choose to accept it…' [The challenges are] never something straightforward. There's a catch, a twist of absurdity that makes it interesting — like catching fish hanging off of a crane 115 feet in the air or pulling up to the marina with Amish horses." Lefebre says it all boils down to "having fun" and featuring the area in a positive light. From a personal standpoint, it makes for a great excuse for him to spend more time at home around his family. The "gypsy" lifestyle of touring nine months a year can be wearing. "A national show would've defeated the purpose," says Lefebre. Despite its hometown flavor, the show has trawled in audiences from as far north as Toronto (Buffalo's FOX station, which reaches into Ontario) and as far south as Pittsburgh (the CW) on network TV. Meanwhile, the YouTube channel dangles the lure of NWPA to audiences worldwide — that is, if they're not already in on the secret. "During steelhead season, you'll see license plates from all over the country," says Olsen. Beyond that, the most reliable item in their Erie Extreme's tackle box might be its personality and sense of humor. As Lefebre puts it: "We're still idiots; we just have better equipment."